Trick or Treat. Healthy Teeth. Observant toddler Elena sits on her mother’s lap as she scans the dental exam room. 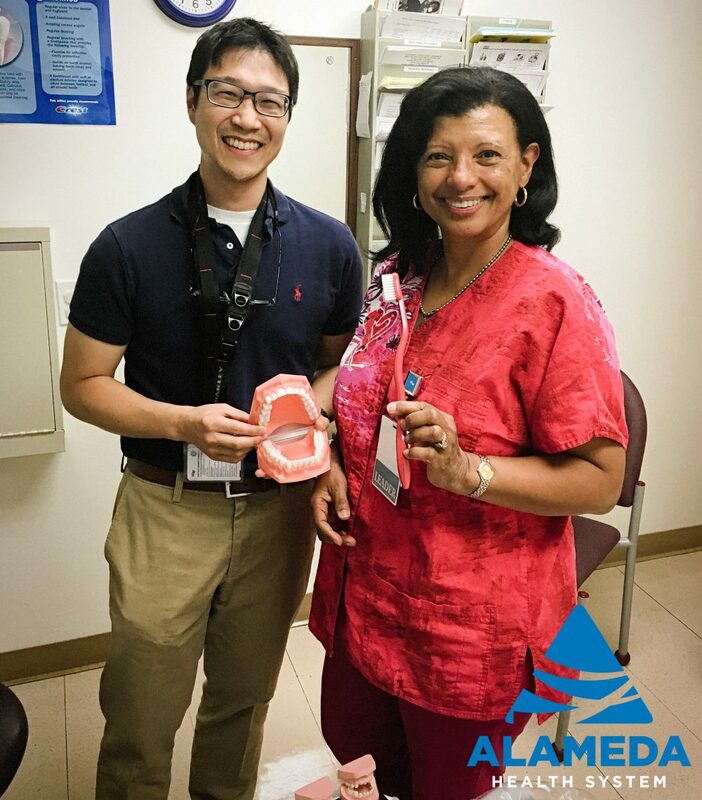 She looks at the camera, she looks at the dental tools, and she looks at Pamela Alston, DDS, director of dental health services at the Alameda Health System (AHS) Eastmont Wellness Center. Alston, who has been a general dentist with AHS for 35 years, prepares to examine Elena for her first dental appointment. Alston inspects the toothpaste and toothbrush Michelle has been using on Elena to make sure they are age appropriate. She then provides her with additional oral care education before doing the examination. Once finished Alston says, “Good job Mom!” Elena didn’t have any cavities or signs of tooth decay. Next, Alston brings in Nicholas Ching, DDS, AHS staff and pediatric dental specialist to see Elena. Alston and Ching are unique in the sense that they both are at ease treating children. Unfortunately, a lot of dentists are uncomfortable having younger patients because there isn’t a lot of behavior management training offered in dental school and if they do see a younger patient, they are typically easier to handle. Ching talks to Michelle about how much candy Elena should have on Halloween. Almost 4% of candy consumed in the U.S. happens on Halloween. Dental Hygiene Awareness Month is also in October. Coincidence or message? What’s Halloween without a good horror story? And who better to tell that story than a dentist? Both dentists say that a common misconception is that only sweets are bad for your teeth. Anything that is considered a fermentable carbohydrate (includes fruits vegetables, starches, dairy and others) can promote cavity formation, even organic food can contribute to cavities. Additionally, “grazing” on food or snacks over an extended period of time is worse than just eating it all at once. They would prefer for someone to eat that piece of cake in one sitting instead of nibbling on it for a few hours because the nibbling increases the teeth’s exposure to the fermentable carbohydrate that contributes to cavity-causing bacteria. Their recommendation is after eating sweets on Halloween or in general, wait twenty minutes, so saliva has time to break down the starches and sugar in the mouth and then brush your teeth. In regards to sweet treats, Alston thinks it is ok on occasion but recommends that parents don’t reward their children with food because that can lead to a long-term association of unhealthy food and good behavior. If it seems like Alston and Ching have a great dentistry “chemistry” it’s because they have known each other for a long time and they both became dentists for the same reason, to help people. Alston and Ching are both Bay Area natives and alums of the University of California, San Francisco, School of Dentistry. While they weren’t there at the same time, Ching was one of Alston’s externs at the Eastmont Wellness Center. He studied his specialty in pediatric dentistry at the Harvard School of Dental Medicine. Upon completion, he returned to the Bay Area and to working with Alston again at AHS.